You might be asking what “service centric” means. Let’s start with ITIL guidance, where Service Management is defined as a set of specialized organizational capabilities for providing value to customers in the form of services. In this definition, service and value are key words that are intrinsically tied together – if your services are not providing value, your customers are not happy. A service centric vision includes elements of process, technology, roles/responsibilities and organizational structure that work together to form a service value chain – a set of interdependent capabilities that deliver value to your customers and the associated business constituency. Many organizations are working on ITSM initiatives with a technology orientation (inside-out perspective) instead of a service orientation (outside-in perspective). In fact, many ITSM initiatives are launched as technology projects with little consideration for ITSM processes or necessary organizational change. These projects typically run into trouble and invariably do not provide the service value that was assumed or promised. Understanding the service value chain will enable you to extend the ITSM vision to include a service centric approach that provides better value to your customers and enables you to operate as a trusted partner in your organization. In my experience, I see two types of service value chains: technology focused and business focused, both are rooted in good intentions and provide improved IT capabilities. To some degree, both rely on each other. However, limiting the ITSM vision to a technology focused service value chain will limit IT’s ability to effectively service their customers. Figure 1 represents a technology focused value chain. Using a broad brush to represent the various functions and activities provided by IT, this type of value chain delivers specific technology focused solutions. For example; servers, databases, applications and associated support functions. 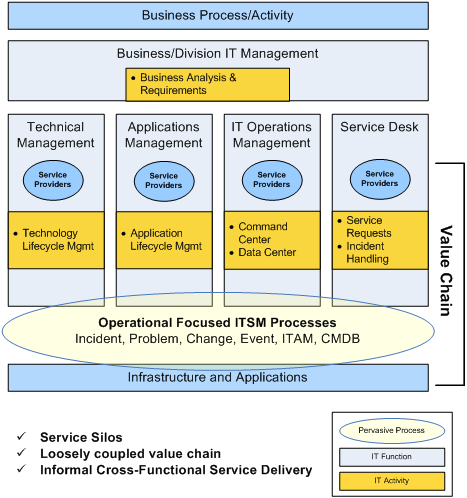 There are numerous service providers located throughout the functional organizations,each providing a specific technology capability within their domain with little knowledge of how other activities interact with theirs to deliver value to the business.These capabilities can be loosely held together by a framework of operationally focused ITSM processes (I.e., Incident, Change, Problem, etc.). In this model, visibility and linkage to the business is technically focused. Service delivery and coordination across the various organizations is typically informal and not standardized. The result is a loosely coupled value chain resulting in uneven and often unsatisfactory service to the customer. Figure 2 depicts a business focused value chain. 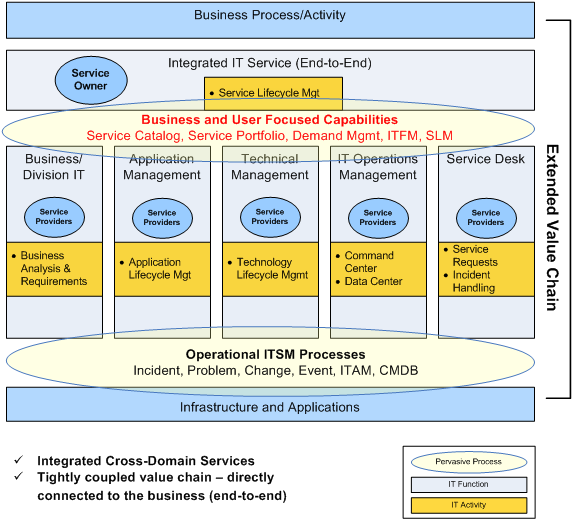 Note that this value chain leverages the underlying operational ITSM processes (e.g. ; Incident, Problem, Change). The key difference is the addition of pervasive business focused ITSM processes and capabilities that enable “end to end” services and facilitates direct business engagement. Another key difference is re-orienting service ownership to span across the technology functions. The service owner takes responsibility for managing service delivery, end-user experience and business value across the technology stacks, extending the value chain directly to business processes and activities. There are many approaches to enabling business focused services. Each organization has a unique set of challenges and opportunities that influence the approach. But it starts with a vision. So, what is your ITSM vision?